We’d love your help. 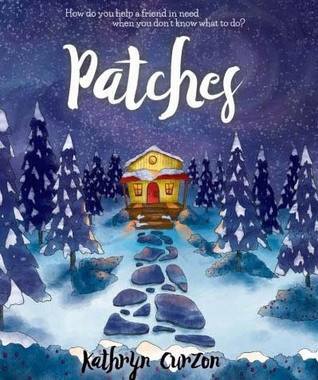 Let us know what’s wrong with this preview of Patches by Kathryn Curzon. Patches: How do you help a friend in need when you don't know what to do? A Readers Favorite 5 star review book. In this touching and heart-warming story, readers discover simple ways to help a friend struggling with depression and grief. With giant furry Pat as their guide, they go on a magical winter adventure in a forest, and discover a real, and very sad, Thing. Deciding to take him home, Pat lets Thing's sadness in, accepts it, and loves it A Readers Favorite 5 star review book. In this touching and heart-warming story, readers discover simple ways to help a friend struggling with depression and grief. With giant furry Pat as their guide, they go on a magical winter adventure in a forest, and discover a real, and very sad, Thing. Deciding to take him home, Pat lets Thing's sadness in, accepts it, and loves it until he heals. Using beautiful imagery and story-telling, Pat teaches adults and children the importance of reaching out to a sad person; giving love and kindness during times of grief. Suitable as a bedtime storybook and for read aloud sessions with adults, children will want to curl up with Pat time and again. To ask other readers questions about Patches, please sign up. Such a lovely sensitive story. Kathryn has managed to personify depression in a child friendly way. This story is important and should be part of all children's libraries.